Alexandrium Bloom Aerial photo of a bloom of Alexandrium monilatum near the Goodwin Islands in the lower York River. This species has largely replaced the Cochlodinium polykrikoides that was blooming in the area earlier. Photo by Dr. Wolfgang Vogelbein. Cochlodinium Bloom Aerial photo of what is likely a blooom of Cochlodinium polykrikoides in the James River near the Monitor-Merrimack Bridge. The bloom extends from above the James River Bridge downstream into the main-stem and western branch of the Elizabeth River as well as into the Lafayette River. Photo by Dr. Wolfgang Vogelbein. 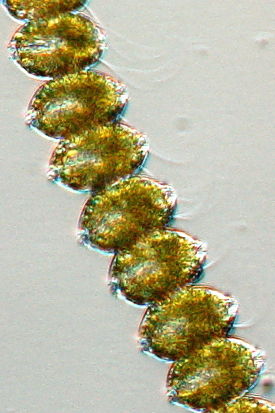 The bloom—which has been observed and sampled in the York River, the North River, and throughout Mobjack Bay—is dominated by a single-celled protozoan dinoflagellate called Alexandrium monilatum. This is a different species than Cochlodinium polykrikoides, the dinoflagellate associated with the bloom that discolored large areas of lower Chesapeake Bay in August. The Cochlodinium bloom now seems to have died down in the York River region, though other Cochlodinium blooms persist in the lower James River near the Monitor-Merrimac Memorial Bridge, in the Elizabeth and Lafayette rivers, and near the Chesapeake Bay Bridge Tunnel. The current A. monilatum bloom began in late August, similar in timing to the onset of A. monilatum blooms in the York River during the past few years. A. monilatum was first conclusively detected in Chesapeake Bay in 2007, when VIMS professor Kim Reece and colleagues used microscopy and DNA sequences to identify it as the dominant species of a bloom that persisted for several weeks in the York River. Earlier reports of Alexandrium in the Bay, from the mid-1940s and mid-1960s, do not clearly identify the species as A. monilatum. The organism is known to produce a toxin called goniodomin A, but the toxin’s potential impacts to marine life and human health remain largely unknown. Experiments done in the laboratories of Reece and professor Wolfgang Vogelbein at VIMS have demonstrated that exposure to A. monilatum cells, both whole and broken, causes mortality in their test organisms, the brine shrimp Artemia salina and larvae of the native eastern oyster Crassostrea virginica. Reece and colleagues continue to monitor the bloom's distribution and density, which have varied widely over the last few days. "We were out on Friday afternoon [August 30]," says Reece, "and found dense patches of A. monilatum near the Goodwin Islands with long chains of cells reaching counts of more than 7,000 cells per milliliter." A 1-liter soda bottle holds 1,000 milliliters. “The bloom has been very patchy,” adds Reece. “Tides, winds, and vertical migration are all playing a role. We’re seeing high variation among the samples, even between those that were collected from sites a few hundred yards apart or taken from the same site a few hours apart." Reece reports that bioluminescence has also been observed recently in local waters. "We recently collected a sample from Sarah's Creek where bioluminescence is occurring," she says, "and have confirmed that it associated with the sexual stage of Alexandrium."